Find us on Facebook or email us! Celebration of Music . . .
Entertainment and Music All Weekend Long! Art on the River has so many great local musicians who come out every year to participate and entertain! There is something for everyone on the Art on the River stage. In the West Quay lot you will find the main stage, which will feature a wide range of genres to listen to. From big band sounds to classic rock and blues . . . 2 days of non-stop music will keep the energy high and your feet tapping! 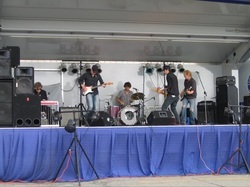 Over the last 3 years, Art on the River has featured Vinny Dombrowski and the Orbitsuns as the 2011 and 2012 headline band. In 2013 The Steepwater Band took the stage. Barbara Payton and the Instigators were the 2014 & 2018 headline band. 2016 featured Black Oak Arkansas as the headline band on Saturday night. 2017 saw Rio and the Rockabilly Revival tear up the stage for a heart stopping performance! It's always a party time at Art on the River. The 2018 Stage Line Up!